Version 9 is an older version of Crystal Reports which is no longer available for purchase. For current pricing or to buy a current version of Crystal Reports, please see the Products page. To view Crystal Reports rpt files, schedule reports for automatic update and delivery, and more see our products that work with Crystal Reports. 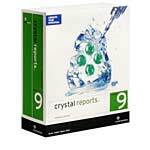 Crystal Reports 9 - Professional Edition $495 Please see the Crystal Reports 9 page for updated purchasing options. Crystal Reports 9 - Developer Edition - Electronic Delivery $595 Please see the Crystal Reports 9 page for updated purchasing options. Crystal Reports 9 - Advanced Edition $1995 Please see the Crystal Reports 9 page for updated purchasing options. This dynamic, computer-based training will help you become an expert at report creation. Over 60 lessons that help you start creating reports quickly. Learn how to connect to databases, add multiple tables to a report, create graphs, formulas, subreports, and more! At your own pace, directly from your desktop, learn how to create interactive, rich reports that users can use to analyze data for better decision-making. Recommended for those who want to learn the basics of report design using Crystal Reports 9. $149 Please see the Crystal Reports 9 page for updated purchasing options.